A project at MIT has succeeded in replacing the common plastics frequently used for 3D printing with cellulose, the same abundantly available fiber that gives plants their structure. The purpose of the research effort was to come up with a possible renewable and biodegradable alternative to the more commonly used ABS and PLA printing materials. Cellulose is already used for that most common of printing medium — paper. But until now, efforts to use it as an ingredient in 3D printing have run into snags. One problem is that 3D printing requires heating up the printing material to make it flowable; but cellulose tends to decompose when it's heated, owing in part to the destruction of its hydrogen bonds. Also, the bonding among cellulose molecules in high-concentration cellulose solutions creates a polymer that is too sticky for 3D extrusion. 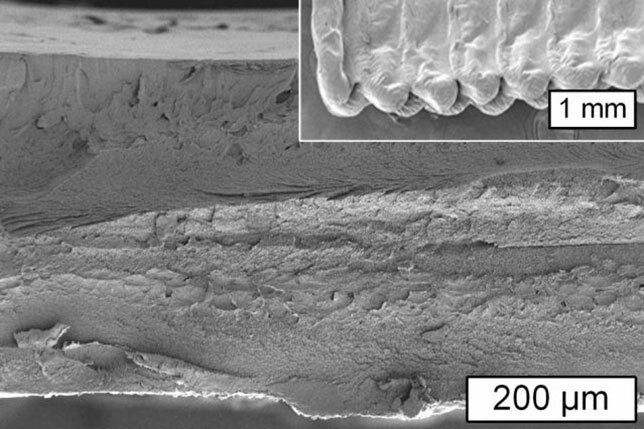 This electron microscope image shows a cross-section of an object printed using cellulose. The inset displays the surface of the object. Courtesy of the MIT researchers. To overcome those hurdles the MIT team, led by post-doctoral fellow Sebastian Pattinson, worked with cellulose acetate, a composition that's easily made and widely available and that can be used at room temperatures. According to an article on the MIT website, cellulose acetate dissolves in acetone and pours through a nozzle. As the acetone evaporates, the cellulose acetate solidifies into place. A subsequent optional process increases the strength of the printed parts. "After we 3D print, we restore the hydrogen bonding network through a sodium hydroxide treatment," Pattinson explained in the article. The result is a printed part with greater "strength and toughness" than would be found in a part printed in the traditional plastics. Various methods could also quicken the printing process, such as blowing hot air over the object to speed up evaporation of the acetone. To demonstrate the "chemical versatility" of the printing process using cellulose, Pattinson and his team added a touch of antimicrobial dye to the cellulose acetate ink and 3D printed a set of antimicrobial surgical tweezers. This MIT research project demonstrated the chemical versatility of 3D printing with cellulose by producing a pair of surgical tweezers with antimicrobial functionality to make them sterile. Courtesy of the MIT researchers. "We demonstrated that the parts kill bacteria when you shine fluorescent light on them," Pattinson noted. He suggested that this type of custom tool "could be useful for remote medical settings" where surgical tools are difficult to obtain and where the sterility of the operating room isn't "ideal." Cellulose is "the most important component in giving wood its mechanical properties. And because it's so inexpensive, it's biorenewable, biodegradable and also very chemically versatile," said Pattinson. It's also highly common. Cellulose and its derivatives are already used in pharmaceuticals, medical devices, as food additives, building materials and clothing, he pointed out. "A lot of these kinds of products would benefit from the kind of customization that additive manufacturing [3-D printing] enables." The research was funded by a National Science Foundation grant. A paper on the findings was recently published by Advanced Materials Technologies, a Wiley journal.